Storytime is more fun then ever with the Teddy Ruxpin Storytelling 14-Inch Plush. Your little ones will love to read along to the story Teddy is telling on the App! Teddy Ruxpin has stories built-in, so your child can take Teddy anywhere and anytime for story-time. 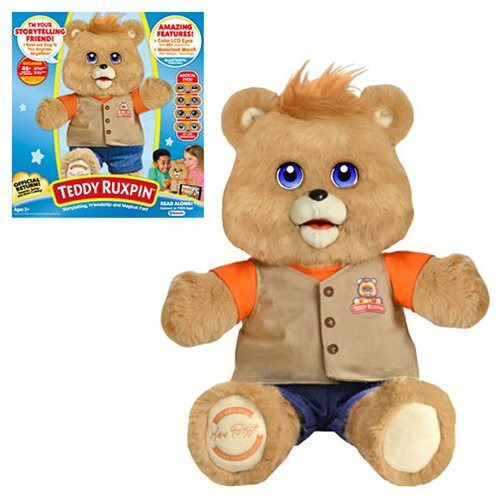 The Teddy Ruxpin features LCD eyes with expressions and a motorized mouth that makes hearing his stories more fun. Measures about 14-inches tall. Requires 4x "AA" batteries, not included. Ages 2 and up. Children of the 80’s Rejoice! Teddy Ruxpin Is Back!